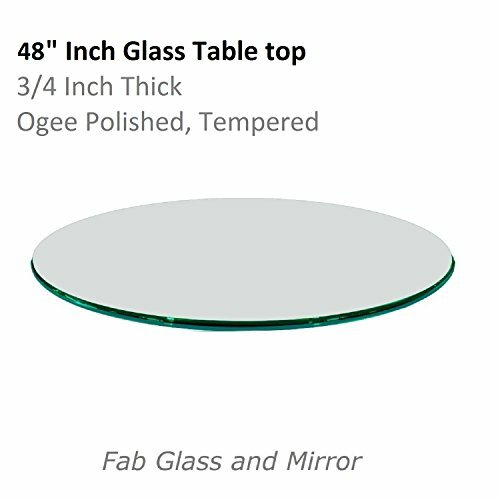 48 inch round clear glass table top: Ogee Edge 3/4 inch thick tempered glass/safety glass: Perfect if you are searching for a flat surface that may not stain, may use as dinning table, office/home, lobby, desk or coffee table. Available sizes: From 12" inch up-to 72 inch, clear glass processed to be close to perfect yields no air bubbles. Delivered via FedEx freight. Available sizes: 12", 14", 18", 20", 22", 23" ,24",25", 26", 28", 30", 32", 34", 36", 40", 42", 48", 54" and 60"
Fab Glass and Mirror 1/2" Thick Ogee Tempered Round Glass Table Top, 42"
Fab Glass and Mirror 1/4" Thick Flat Edge Tempered Eased Corners Rectangle Glass Table Top, 24" X 48"
Fab Glass and Mirror 1/2" Thick Ogee Tempered Glass Round Glass Table Top, 66"